Scant little attention is usually paid to shooting glasses or to safety glasses in general. For decades, I was crawling around industrial plants measuring and designing equipment. Alternately wearing eyeglasses and contacts, I quickly learned to carry my own safety glasses-- as the "safety" glasses given out at the reception area were invariably scratched, fogged, and ill-fitting. Walking into a steel beam, wall, or falling off of a ladder because you are mostly blind is not my particular version of safety. In shooting sports, at the range or in the field, you'll often see a plethora of gas station or drug store glasses. Some opt for the Chinese bubble-packed plastic sets emblazoned with Chuck Hawks' favorite brand, "RemChester," from the local Wally World. As much as shooters banter about optics, you might think we'd care a bit more about what we are looking through all the time. For those that do insist on seeing what they are shooting at, help is on the way. Post 4 Optics is run by Mike Rinard, Sr., avid hunter and shooter. For years, his profession was making lenses at his optical lab-and he is a master at it. After five years or so of testing, designing (sounds a lot like hunting and shooting to me?) 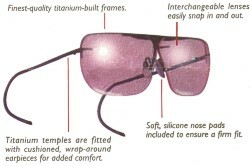 Mike decided to introduce a custom line of titanium framed glasses with interchangeable lenses to the sports industry. Regardless of ambient lighting conditions, there is a Post 4 lens that can improve your ability to find game or targets. Naturally, as Mike grinds his own lenses, prescription lenses any way you need them are just no problem. Post 4 Optics has become quite a hit, with Olympic competitors that settle for nothing but the best turning to Post 4 Optics for their needs. Post 4 does not use pre-cast material at all; the custom grind all of their lenses in house, and apply their own multi-chemical tinting coatings. This gives Post 4 capabilities that few others, if any others, gave in the industry. It is the only interchangeable lens titanium frame system on the market. Post 4's high definition lenses can really cut through the haze, and make outlines of objects jump out at you. I've been driving and shooting experimenting with a few different lenses for some time now-and I can tell you they really can make a difference. A visit to Post 4 Optics website at http://www.post4optics.com might leave you amazed at the vast variety of options that are available-it sure did me. You'll like find that just a couple of sets of lenses fulfill the majority of your needs, as I have. Post 4's "Lite Target Orange Glow" is a subtle enhancement good for both low-light and general applications when you need more definition. Yesterday was our Illinois Dove Opener, I found that Post 4's "Purple Passion" lens was exceedingly comfortable to look through, and killed the background clutter and flare-- allowing me to easily concentrate on little gray rockets. They worked like a charm, and I limited out in no time. Mike Rinard, and his son, Mike, Jr., enjoy talking with customers directly, offering custom recommendations and custom guidance based on years of both optics lense-making experience and shooting around the country, in all conceivable ambient light conditions. I can't recommend them highly enough. If you really want to see what you have been missing, you'll want to give them a call after checking out their website at (800) 833-6362. You'll be glad you did.